Presently more than 50,000 baths and showers are produced each month in the modern factory. Bette is a specialist for steel/enamel product production, with shaping and enamelling techniques exclusive to the company, around 500 different models are produced by about 270 employees. 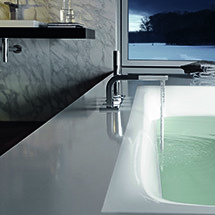 "In Europe there are three major manufacturers of steel/enamel baths. If you were to put their products side by side you would be able to recognise which are made by Bette: the ones with the most attractive finish. That is our ambition, at any rate". Fritz-Wilhelm Pahl, head of Bette.